Down my memory lane my friends would make fun of me saying”I thought that kollu/horse gram is only for feeding horses but you make a meal out of it”but this was the case long back and now they too make quite some dishes out of it realizing its health benefits.Horse gram a high-powered legume with lots of diuretic(pushes out unwanted water out of our body) goodness and it is used as one of the main items in ayurvedic treatment.The legume by itself is hard but if we take it in sprouted form it is easily digestible and has a high amount of slowly digestible carbohydrates which is diabetic friendly. Before making this rasam make sure to read my recipe for kollu paruppu so that you will understand the process of making this rasam.This is a very simple kind of preparation because the sprouted gram itself has its own natural sweety aroma that makes this rasam very unique and awesome.Both kollu paruppu and rasam are very authentic recipes done in our region!it continuous to be a weekly affair in all our households.If you want to know sprout making with horse gram then check here. Note: These sprouts are pressure cooked along with water and water alone is used for this rasam. 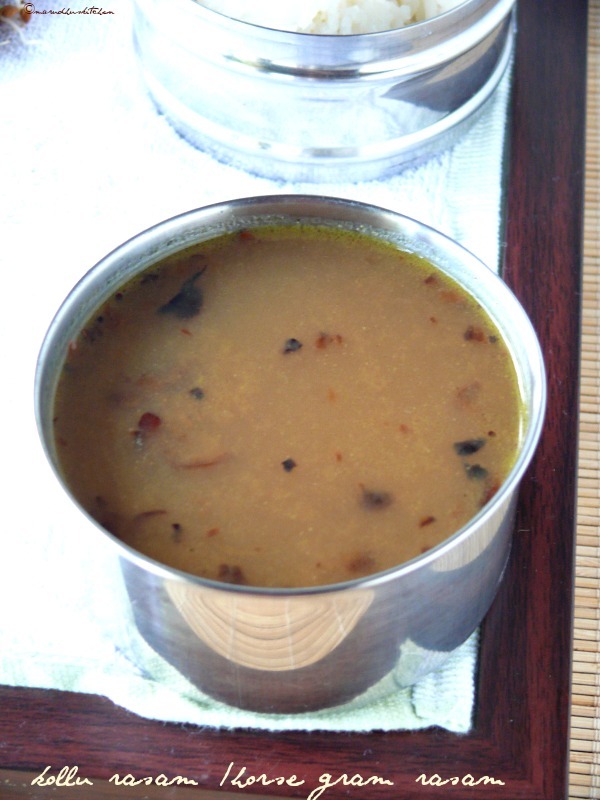 1.Remove the extract of horse gram after pressure cooking and keep ready for rasam. 3.Now keep kadai add ghee,mustard and when crackles add vadakam then the tamarind extract. 4.When it is boiling add salt and jaggery . 5.Let it boil till rawness goes now add the kollu extract and keep in sim for some time and switch off. Remove the extract of horsegram after pressure cooking and keep ready for rasam. Now keep kadai add ghee,mustard and when crackles add vadakam then the tamarind extract. When it is boiling add salt and jaggery . Let it boil till rawness goes now add the kollu extract and keep in sim for some time and switch off. Please refer my kollu paruppu recipe procedure so that you will make nice flavorful extract of kollu. 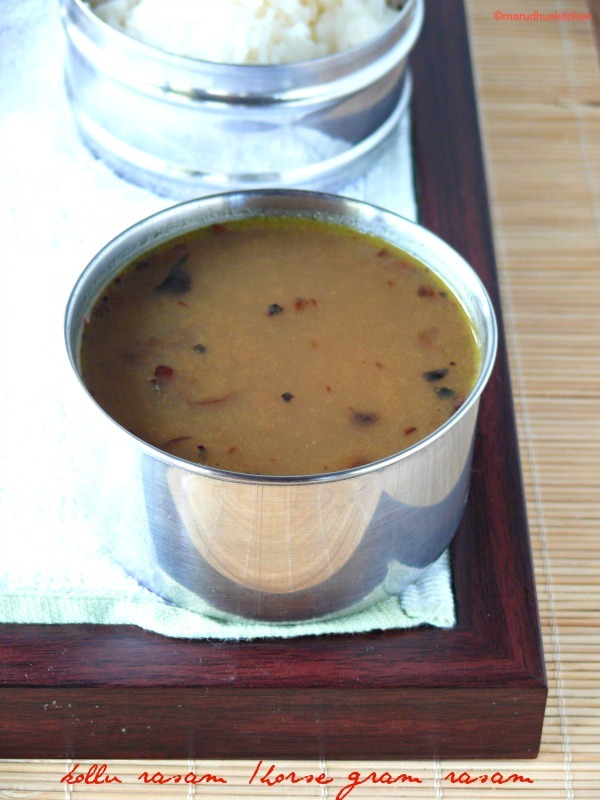 Both kollu thovayal and rasam are made from sprouted horse gram which is healthy and delicious. Adjust the salt accordingly because we have already added salt while pressure cooking the sprouts. We have to boil the tamarind for its rawness to go but for kollu extract it is not necessary. I love this rasam! !..There is a very famous authentic dish is Andhra made with horse gram known as Ulavachuru, which is a very long process:)…Next time will try your version as it looks simple that too with sprouted…SUPERB! !…Thanks for sharing dear!! healthy rasam!! good to keep the traditional recipes alive!! Loving this yummy and comforting Rasam! perfect vth rice n some fry..love to try it.. Perfect rasam.We love kollu rasam a lot,don’t know if its available here. Amazing rasam. It must be warm and soothing. Love this rasam recipe !! This is so wonderful dear Vani. A very delicious Rasam made to perfection by you. Looks so inviting and appetizing dear. I am loving it totally.